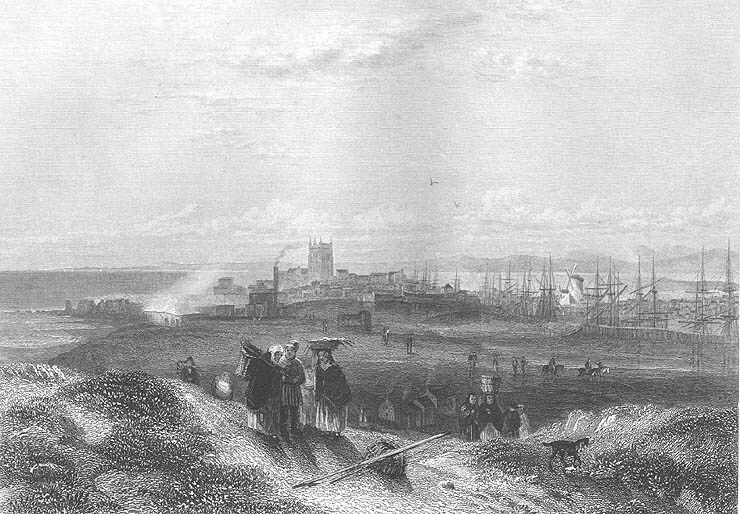 An engraving of Hartlepool, England in 1840. St. Hilda's church is in the background. Detective work in the St. Hilda’s Church records, done by our UK friend Heather, has produced a clue to Ann Robinson Storey’s ancestry. To date, the surnames of the females who married into this Robinson line are Pounder and Rowntree. Unfortunately, numerous individuals with the name of Pounder, Robinson and Rowntree lived in Old Hartlepool, so distinguishing between families is often difficult. There is limited information on these lines and some is speculation. FRANCIS ROBINSON was baptized at St. Hilda’s Church, Hartlepool, England on June 12, 1774 and married ANN ROWNTREE. Francis Robinson and Ann Rowntree were married on June 7, 1795 at St. Hilda’s Church, Hartlepool, England by W. Harrison, minister. Witnesses for the ceremony were William Hood and Robert Shadforth. Neither Francis Robinson nor Ann Rowntree were able to write their name, but signed with an “X”. William Robinson baptized January 1, 1796 at St. Hilda’s Church, Hartlepool, England. Elizabeth Robinson baptized January 12, 1799 at St. Hilda’s Church, Hartlepool, England. GEORGE ROBINSON was born in Hartlepool, England on January 22, 1804 and was baptized at St. Hilda’s Church, Hartlepool, England on February 19, 1804. George Robinson married ELIZABETH POUNDER. Joseph Robinson was born on July 10, 1805 in Hartlepool, England and was baptized at St. Hilda’s Church, Hartlepool, England on July 13, 1805. Another son, but do not know the name. George Robinson, a fisherman from Hartlepool, England married Elizabeth Pounder of Hartlepool, England on May 14, 1826 at St. Hilda’s Church, Hartlepool, England. The ceremony was performed by William Wilson, Curate of Hartlepool. Witnesses were: William Horsley, George Comer and John Fletcher. Neither George Robinson nor Elizabeth Pounder were able to write their name and signed with an “X”. ANN ROBINSON born in 1827 in Hartlepool, England, baptized on December 30, 1827 at St. Hilda’s Church, Hartlepool, England and married JOHN STOREY. When Ann married John Storey the witnesses were Mary Robinson (perhaps her sister) and William Sharps. In 1870, when Mary Ann Storey (Ann’s daughter) married George Henry Hughes, the witnesses were Jane Sharp and George Robinson Sharp. Perhaps there is a Sharp connection to one of these families. THANK YOU to Heather from Middlesbrough, England, my Internet friend, who has done all of the research for the Robinson/Pounder lines. THIS PAGE IS STILL UNDER CONSTRUCTION. Work on these lines is ongoing.